This bit of vintage promotion comes from the September 26, 1914 issue of The Literary Digest, hyping (among other things) the last of Jack Boyle’s original quartet of Boston Blackie stories. “A Thief’s Daughter” was the final yarn to bear Boyle’s No. 6606 pseudonym, and the first appearance of Blackie’s beloved Mary. With illustrations from N.C. Wyeth, the tale made for an excellent final bow to Boyle’s American Magazine readers. It would be another three years before Boston Blackie would surface again, in the pages of The Red Book. Over the years, many performers have portrayed Boston Blackie and his beloved Mary, in media ranging from cinema to radio to television. First seen in illustrations for the pages of The American and The Red Book magazines , the “first couple” of the underworld was given form by artists such as N.C. Wyeth and W.H.D. Koerner. But the first flesh and blood pair to bring the characters to life on the silver screen were Bert Lytell and Rhea Mitchell, in Metro Pictures’ 1918 production Boston Blackie’s Little Pal. Lytell would play Blackie again in the 1919 offering Blackie’s Redemption, but that production saw actress Alice Lake assume the role of Mary. However, her performance in Boston Blackie’s Little Pal endows Rhea Mitchell the indisputable title of cinema’s first Boston Blackie’s Mary. Back in 2011, I posted an entry here titled “Ed Hoch and Jack Boyle” which discussed, among other things, the misconception that Boyle was born in Chicago. Hoch made this misstatement regarding Boyle’s hometown in the introduction to Gregg Press’ reprint of the 1919 hardcover collection Boston Blackie, and since that time the inaccuracy has wormed its way into numerous biographical entries. When I asked Ed where that bit of data came from, he said that he had gotten it from Boyle’s 1914 autobiographical sketch, A Modern Opium Eater. At the time, I took this answer at face value, but upon later examination, the essay revealed no such reference. Since my correspondence with Ed took place years after his research for the Gregg Press introduction, I’m sure this was a case of his memory simply failing him. But we’re still left with the mystery of where the idea of Boyle’s Chicago birth came from. And then one day there came into my office in Chicago a tall, handsome chap who announced himself as Jack Boyle, 6606. He had recently been freed from prison, where he had written the articles for The American, and had returned to his old home in Chicago. So it was Jack Boyle’s long-time editor Ray Long who, in a memoriam published just a few years after the Boston Blackie creator’s death, mistakenly credited Chicago as the locale of his birth. Long must have somehow misheard or misconstrued Boyle’s comment about returning to “his old home in Chicago.” It is entirely possible that Jack had, indeed, resided in Chicago at some time prior to his visit to Long’s office in 1917. Large chunks of his life between 1909 and 1915 are a blank, and Jack was known to have traveled the Midwestern states. It’s quite plausible that he lived in Chicago at some point during this gap. But his remark about returning to “his old home in Chicago” did not mean he had returned to his birthplace, just to a place he had lived previously. Census records have long since documented Boyle’s 1881 birth in the State of California, and this is corroborated by his World War I draft registration card. A simple misunderstanding of a friend’s casual remark caused Ray Long to write something which spawned a chain of misinformation for over eight decades. It’s amazing how easily an idea — even a mistaken one — becomes fact, just because it has been written down. This announcement from the July 21, 1923 issue of Camera! is puzzling, and just plain wrong on several levels. Laura La Plante was the female lead in a Boston Blackie production from Universal in 1923, but it was most certainly not a serial. And Miss La Plante did not play Mary. And the film was not titled The Heart of Boston Blackie. And it was not based on a story from The Red Book Magazine. Oh, and it didn’t feature any of the actors mentioned as candidates for the role of Blackie. So just what was this film that Camera! tried almost in vain to promote? 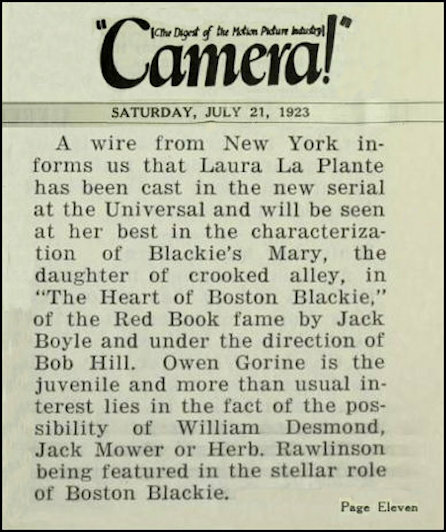 By late summer of 1923, newspapers and magazines ran a number of items about Laura La Plante’s upcoming appearance in Universal’s Boston Blackie film The Daughter of Crooked Alley, but by the time it was released to theaters on November 7, 1923 its title had been shortened to simply Crooked Alley. This early item from Camera! makes it sound as though the film was based on a story in The Red Book, also titled “The Heart of Boston Blackie,” while most other press promoting the film claimed its source was Jack Boyle’s popular magazine tale “A Daughter of Crooked Alley.” In actuality, no magazine ever published such a story by Boyle. Crooked Alley’s scenario was adapted from an original story written expressly for the screen by Jack Boyle. And though Laura La Plante was the film’s female lead, she played Noreen Tyrell (as Blackie’s Mary is noticeably absent from the film). Finally, though Herbert Rawlinson did star in a Jack Boyle inspired drama — Stolen Secrets — in 1924, he never played Boston Blackie. In Crooked Alley, that role went to actor Thomas Carrigan. Though Camera! went far wide of the mark in announcing this production, today Crooked Alley is one of only two Boston Blackie movies from the silent era known to have survived in its entirety. A print is held in the film archives of the University of California Los Angeles, and it was was screened at the 2002 UCLA Festival of Preservation. Perhaps one day it will be made more widely available to modern day fans of Jack Boyle. Amos ‘n’ Andy eventually came back from vacation to reclaim their spot on NBC, but Boston Blackie wasn’t about to relinquish his status as a radio sleuth. Under the auspices of Ziv Productions, the series remained in production until 1951, and available in syndication well beyond that. Not bad, for a character created nearly 40 years earlier. Huh? Get-Rich-Quick who? Jack Boyle never wrote about any character known as Wallingford, and yet numerous press releases in the 1940s connected the name to Boston Blackie. What’s the story? Actually, confidence man J. Rufus Wallingford was the literary creation not of Jack Boyle, but of a phenomenally popular author in the earliest days of the 20th century, named George Randolph Chester. The character first appeared between book covers in the 1908 collection from the Henry Altemus Company Get-Rich-Quick Wallingford: A Cheerful Account of the Rise and Fall of an American Business Buccaneer (though the tales first appeared individually in issues of The Saturday Evening Post a year earlier, in 1907). So the Wallingford series debuted and found a wide readership a decade ahead of Boston Blackie. While there is no actual connection between George Randolph Chester’s sharp-dealing protagonist and Jack Boyle’s notorious safe-cracker, the Wallingford series did prominently feature a character named Blackie. The protagonist’s partner in crime was a shady fellow named Blackie Daw. And that’s where confusion has arisen over the years. The similarity in names between George Randolph Chester’s con man Blackie Daw and Jack Boyle’s master criminal Boston Blackie Dawson has led a number of sources to confuse the two characters. Press releases for Meet Boston Blackie were not the only items that connected Boyle’s burglar to Get-Rich-Quick Wallingford. Promotional material for the syndicated Boston Blackie radio series made the same mistake at least as late as 1948, and some reference works published well into the 21st century have erroneously credited George Randolph Chester with creating Boston Blackie. Certainly, the existence of two popular characters with such similar names — created within several years of each other, and both living on the wrong side of the law — is confusing. But is the similarity of their names a coincidence? Perhaps not. When Boston Blackie first appeared in The American Magazine in 1914, he had no other name. He was simply Boston Blackie. But when he resurfaced in the pages of The Red Book Magazine three years later, he had acquired the surname Dawson. A few years after Jack Boyle’s death, Red Book editor Ray Long recorded his recollection of how the author came to resurrect Blackie for the pages of his magazine. During a visit to Long’s Chicago office, Boyle spoke with him about the current crop of fiction, and criticized a story about a professional confidence man. His complaint was that the fellow in the story could be recognized as a criminal by a ten year old child. “‘Confidence man’ means a man who wins your confidence. That’s his stock in trade. The fellow in your story couldn’t win the confidence of any one. If such a person tried the confidence game, he’d starve to death.” In response, Long encouraged Boyle to furnish some stories about “real crooks,” and the result was “Boston Blackie’s Mary,” the story in which the name Dawson first appears in the Blackie canon. Certainly, there is no way to prove that it was one of George Randolph Chester’s stories that Boyle was criticizing, or that the confidence man in question was Blackie Daw. However, it is unquestionable that Chester wrote for a number of popular periodicals during this period (including The Red Book and Cosmopolitan), and that the Get-Rich-Quick Wallingford stories made numerous appearances in magazines and newspapers. The series was firmly in the public eye the day that Boyle paid his visit to Long’s office. While it’s possible that he was referring to a story about another confidence artist, it strains credibility that he would subsequently just happen to name his own character so closely after another con man from popular fiction of the time. It seems more plausible that, in naming his own character Blackie Dawson, Jack Boyle was tweaking the nose of the creator of Blackie Daw. Again, there is no way to prove this speculation, so it must be taken, at best, as a hypothesis. Did Jack Boyle name his most famous character in response to an already-popular criminal protagonist whom he found absurdly unrealistic? No one can say. But if he did, to some degree his joke backfired on him. Decades later, people confuse Blackies Dawson and Daw, giving rise to questions of exactly who created Boston Blackie. I doubt Boyle would have been so keen to christen Blackie the way he did had he known that it might cast doubt on his creation of his own most popular character.